I’ve decided to make an Alen FIT50 review since it’s a smaller version of my favorite Alen Breathesmart model. This unit can handle smaller rooms and comes at a more reasonable price. Meanwhile, the air purifier seems to have all the wonderful features its bigger brother does. It has numerous smart options, different panel colors, a choice of HEPA filters, an ionizer, and much more. The unit also comes with the famous Alen lifetime warranty. Let’s take a closer look at this air purifier to find out whether it’s a reasonable alternative to Alen Breathe smart. This air purifier has a more or less standard 3-stage filtration system. The best part about it is that you can choose different types of HEPA filters for the second stage. Pre-Filter – The back foam layer of the filter is attached with Velcro and can be removed and washed. This pre-filter captures large particles, not allowing them to move to the next layer of the filter, thus improving the HEPA filter’s life expectancy. You can wash or vacuum the filter about once a month. HEPA Filter – This filter captures 99.97% of all contaminants 0.3 microns in diameter. It deals with pet dander, mold spores, VOCs, chemicals, viruses, and more. Every respectable air purifier manufacturer uses some kind of a HEPA filter. While the majority of air purifiers are compatible with one certain HEPA filter, Alen FIT 50 gives you 4 options. The filter should be replaced once in 9 to 12 months. The cost depends on the filter you choose. HEPA Pure Filter – focuses on dealing with dust and allergens. Suitable for residential homes and offices. The replacement cost is about $80. HEPA FreshPlus filter –designed to deal with chemicals and VOCs. Suitable for labs, hospitals, and residential homes. The replacement cost is about $120. HEPA OdorCell Filter – focuses on heavy odors and smoke. Suitable for households with smokers, kitchens, restaurants, etc. The replacement cost is $120. Ionizer – The air purifier is equipped with an ionizer, which attracts negatively and positively charged particles to make air cleaner and fresher. The ionizer is optional and can be turned off and on using one of the top panel buttons. Alen FIT50’s filtration system is excellent. Its customization options allow numerous owners to create a purifier suitable for their environment. However, the yearly filter maintenance costs are considerable. The Alen FIT50 design is highly appealing. Compared to its full size brother, it’s smaller and more compact. 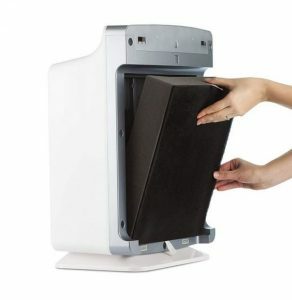 The air purifier weighs just 16 pounds and it’s dimensions are 10 x 16.8 x 22.2 inches. You can choose one of the 13 panel colors to make sure the unit suits your interior design decor. The colors range from white and black to pink and champagne. You can also pick one of the natural tree shades. The air purifier has an elegant control panel, which is straightforward and easy to operate. Even though the unit is bulky, you are likely to find a perfect spot for it in any room regardless of its size. Overall, the unit is well designed and can become an integral part of your room’s décor. Alen did a wonderful job equipping the air purifier with all the necessary options for comfortable use. Air sensor – this sensor checks the air quality to show if the fan speed needs to be changed. The LED light around the power button tells you how clean your air is at the moment. The blue light means that the air in excellent condition. An orange (or yellow) light shows that the air quality is decreasing. The red light signals bad air quality. Filter life indicator – The filter life indicator allows you to see when it’s time to think about filter replacement. It takes the weight of remembering when to change the filter off your shoulders. The light will change the location halfway through the filter’s life and then at the time it needs to be replaced. Timer – You can set the air purifier to turn off 4, 8 or 12 hours after it starts working. This is an excellent energy-saving option. Auto-Mode – Using the air quality sensor, the air purifier changes the fan settings to keep the air quality at its highest. As soon as the number of contaminants exceeds reasonable levels, the air purifier increases the fan speed. The fan speed goes down when the quality returns to normal. Child Lock Option – The Alen Fit50 is equipped with a lock, which can keep your child from playing around with the control panel. The only necessary smart option, which this air purifier lacks, is a sleep mode. Meaning, you have to set the fan to the lowest setting and turn the auto mode off if you need a quiet sleeping environment. Thankfully, you can turn the air quality sensor light off so it doesn’t interfere with your sleep. The bigger brother of Alen FIT50, has the sleep mode. Overall, I liked the number of smart options this air purifier has. The numerous user reviews I’ve gone through, show that all the features work in an excellent manner. This air purifier can’t be named one of the quietest units on the market. However, its noise levels are reasonable. As a light sleeper, I prefer the lowest setting to be at around 20 – 25 dB. This air purifier is somewhat louder but still suitable for bedrooms. At the highest setting, the air purifier may interfere with reading or watching TV. I always check the manufacturer’s words to find out how good the air purifier really is. The simple way to do it is to multiply the CADR by 1.5. For this one, we get is 330 square feet. The unit has a powerful motor so I believe it can service rooms up to 600 – 700 square feet. However, it would need to work at the highest speed all the time. Meanwhile, the results may be achieved much slower. I would recommend using this unit in the rooms up to 600 square feet. 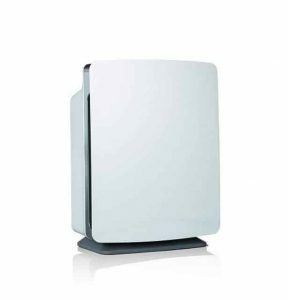 The air purifier comes with the excellent Alen lifetime warranty. For me, it means that the quality of this air purifier is top-notch. The warranty covers the defects in material and/or workmanship. It’s valid only if you use the unit according to the instructions and replace filters on time. 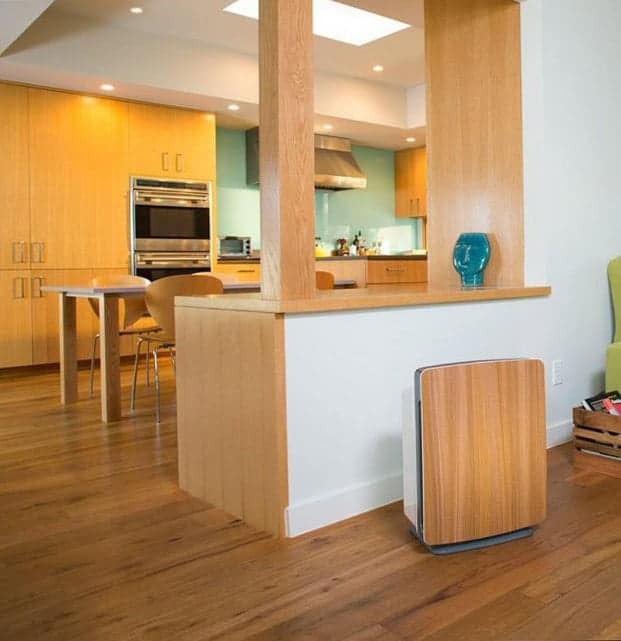 Alen FIT50 is an excellent air purifier for spaces up to 600 square feet. It has numerous useful smart options, including an air quality sensor. The unit isn’t loud. It uses the WhisperMax technology to ensure the quietest operation. The impressive customizable filtration option allows you to choose the right filter for your environment. I would recommend this air purifier to anyone, who needs a high-quality unit, which comes with a lifetime warranty. The Alen Fit50 is just as good as it’s bigger brother – the breathe smart. Yes, it can only serve rooms up to 600ft, but for most of us, that’s more than enough. For the saving of $100, this is a much more affordable unit from what is arguably the best manufacturer of air purifiers in the world today. 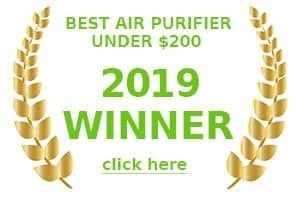 Joint top air purifier of the year right here!